Residents of a Northern California community that had been threatened by a major wildfire have permission to return to their homes by Wednesday afternoon as crews made substantial progress in fighting the blaze, fire officials said. Nearly all of the estimated 1,500 residents from 600 homes who had been under mandatory evacuation orders could go back to their houses at 4 p.m. local time, Anthony Brown, spokesman for California Department of Forestry and Fire Protection, told Reuters on Wednesday. The Pawnee Fire about 70 miles northwest of Sacramento began Saturday. It was considered 25 percent contained, up from 5 percent a day earlier, said Brown. The wildfire has destroyed 12 buildings and 10 outbuildings and charred 13,500 acres, fire officials said. California Governor Jerry Brown declared a state of emergency for Lake County on Monday, allowing more resources to be deployed. 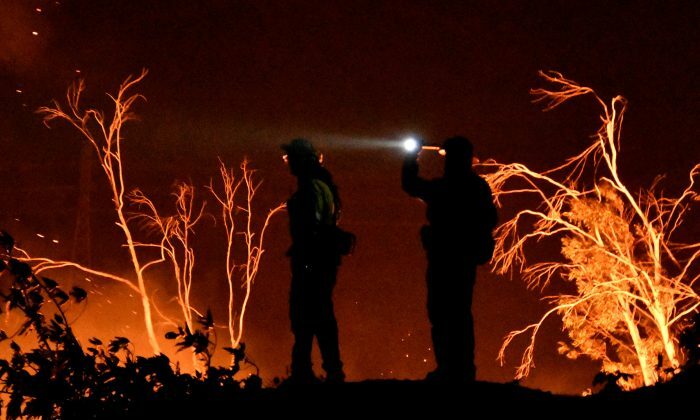 By Wednesday more than 2,700 firefighters were battling the blaze. Even though the emergency has eased, Lieutenant Corey Paulich of the Lake County Sheriff’s Department warned that dangerous conditions could return by weekend. The National Weather Service has issued a fire weather watch for the area starting on Friday. Winds are expected to gust up to 35 miles per hour and humidity is expected to drop to 10 percent. The Pawnee Fire is one of four major wildfires burning in California as temperatures rise and humidity drops across the state. Earlier this week three other major fires were threatening Northern California, but by Wednesday two of those were considered 90 percent contained and one was listed as 65 percent contained. None of the fires are reported to have caused injuries. In New Mexico, almost all of the Carson National Forest closed on Wednesday. It was the first time the 1.4 million acre forest, larger than the state of Delaware, will close because of drought since 2011. The closure is “strictly precautionary” and called due to the area being in the highest level of drought with a high potential of fire danger, said Jim Gumm of the Carson National Forest. The New Mexico fire is not expected to threaten any structures, he said. There is no estimate of when the forest may reopen to the public, Gumm said on Wednesday.